Whether you would simply like to walk a couple of kilometers, or if you are a true walking enthusiast who would like to hike many kilometers: Extremadura has something to offer for everyone. There are many roads suited for walking, in several difficulty levels. There are caminos everywhere; paths via which farmers move their cattle from one dehesa to another. The Via Pecuaria are well-suited for long walks. These are the roads that were in the past used by farmers to move their cattle over longer distances. 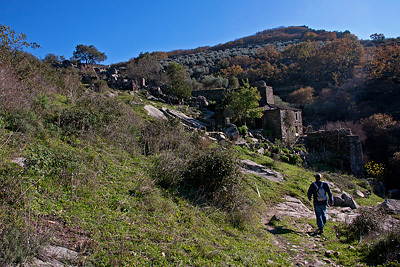 From the finca there are several paths that lead to the village of Arroyomolinos. From there, you can walk the Ruta de los Molinos; An old path leads you up the mountain, past ancient Roman water mills straight through the Sierra de Montánchez. The trail leads to the famous town of Montánchez, where you can taste the local speciality, the Pata Negra. This dried ham is Extremadura’s culinary pride. You can also walk a shorter path from the finca, for days when you don’t want to venture out too far. The Spanish hike a lot. Spaniards always hike with a stick, the bastón. Spain is full of hiking paths. The most famous of these of course leads you to Santiago de Compostela in the North of Spain. In Extremadura, the most famous trail is the Ruta de la Plata. This “Silver Trail” used to lead to the Roman centre of the country: a city we nowadays call Mérida. Alongside the Ruta de la Plata, you can still find the original ancient Roman paths in several places. For more information about hiking in Extremadura, you can read the book “Walking Extremadura” by Gisela Radant Wood. She lives nearby in the village of Almohárin. You could also visit her website. On her website and in the book she describes several walking routes that are close to our finca.